Samford University’s School of Health Professions encourages its students to pursue God’s unique calling on their lives. For many students, their calling is revealed over time, influenced by service-learning opportunities, classroom discussions or the impact of friends or professors. 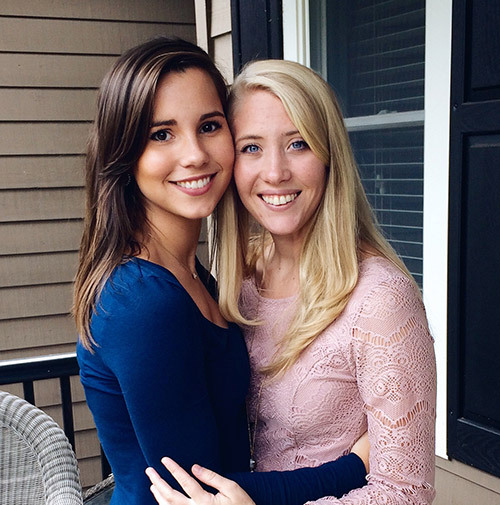 For Catherine Saunders, a second-year Master of Science in speech language pathology student, the relationship with her college roommate set her on a course she had not previously intended. Saunders attended Samford as an undergraduate student. She was an exercise science major with plans to pursue a graduate degree in physical therapy. During her freshman year, she met Jessica Hill, a sorority sister and fellow exercise science major. The two became fast friends and decided to be roommates their sophomore year. Hill is hearing impaired. She was diagnosed with severe hearing loss as an infant, and today, she has the benefit of using cochlear implants in order to hear on a daily basis. One day, Hill told Saunders that she reminded her of the speech language pathologists she worked with growing up. “One of the very first things I noticed when I met Catherine was her voice. I struggle to understand people who are soft-spoken or have deep voices, but Catherine’s voice is gentle, yet direct and articulate,” Hill said. Saunders said that at the time she had never considered speech language pathology as a profession, but with encouragement from her roommate, she decided to enroll in a few classes. “I decided to jump on board and see what communication sciences and disorders was really about,” Saunders said. As Saunders learned more about speech language pathology, the more passionate she became. By the time of graduation, she had accumulated enough credits to receive a minor in communication sciences and disorders along with her Bachelor of Science in exercise science. Following graduation, she surprised her friends and family with the news: She was exclusively applying for graduate programs in speech language pathology. “People thought I was crazy,” she said.